I wish I knew who invented Redneck Haiku, but I don't. These are from the book, Redneck Haiku, by Mary K. Witte. to bring back the kids. Grandpa went once, and now look. He has no teeth left. 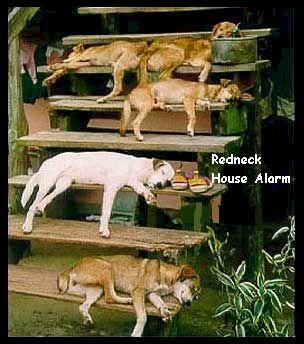 Posted by Bob Wallace, who sez, "SMELLY HOUN' DAWGS ASLEEP/ON STEPS UP TO THE TRAILER/REDNECK HOUSE ALARM!"